Honda (UK) has appointed David Rogers as Motorcycle PR Manager, as it prepares for a packed year of product launches and a full-time return to BSB racing. David joins from the Society of Motor Manufacturers and Traders (SMMT) where he headed the marketing and communications team for its consumer affairs division, Motor Codes. He has a broad background, having led public and political consultation campaigns for the UK's top construction firms, before moving into automotive PR, working extensively with both manufacturers and retailers. "In addition to the excitement already building around the True Adventure and RC213V-S prototypes shown to the public at the end of last year, 2015 brings with it a raft of important new bike launches. David is a biker, as well as a strategic communications expert and his experience will help us bring these landmark new products to market with the excitement and enthusiasm they warrant." 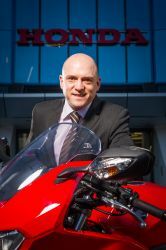 On David's background, Nick Campolucci, Head of Motorcycles adds, "Having served as the communications middleman between dealers, consumers, manufacturers and legislators for a number of years, David is well-placed to co-ordinate delivery of the huge volume of news set to emerge from Honda over the coming months." "I've seen just a snippet of what's in the pipeline so to join Honda at this time is an immensely exciting opportunity," said David. "From the thrill of its race teams - both on and off-road - to the full mix of fun, fast and frugal offered in its road range, Honda has something for everyone. My first bike was a CBR600F - the fetching black, pink and purple '92 paint-scheme - and I can't wait to get to grips with today's cutting-edge Honda line-up."